The July 10th presentation took a deep dive into 6 trends affecting the tourism market in Richmond and made related recommendations for each. Thank you to the Gulf of Georgia Cannery society for hosting the presentation. Annual volume of visitors from outside the Lower Mainland coming to Richmond has increased 8% between 2015 and 2017, consistent with the Vancouver market overall. 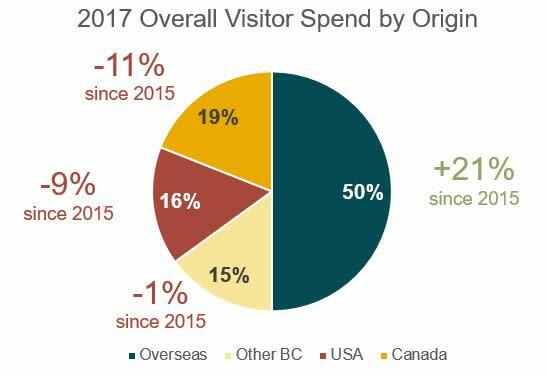 However, annual visitor spending has increased 23% (roughly $330M) since 2015, which far surpasses the Vancouver market. Business visitors are spending more leisure time in Richmond with a $147,000,000 growth in Business Spending Time Doing Leisure between 2015 and 2017. 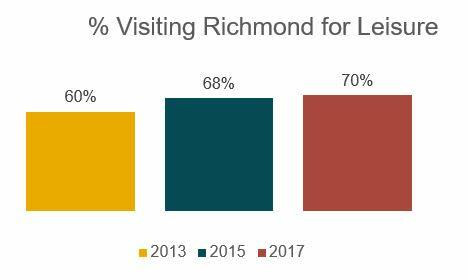 Compared to 2013 and 2015, visitors are more likely to be in Richmond for leisure purposes, and far less likely to say they are here only for the airport. These positive trends show that the accommodation and non-accommodation sectors in Richmond are becoming more intertwined, benefiting everyone. The most frequently mentioned positive association that visitors, both Canadian and international, have with Richmond is good food and restaurants. However, our research shows there are opportunities to expand our culinary offerings in terms of creating food/drink experiences and cross-marketing with wineries, restaurants and farms. Overseas leisure spending, as a portion of total market share, has risen by 21% since 2015, driven by Chinese visitors who will stay on average twice as long for their trip, and are spending large amounts on shopping, especially during the holiday season. See if your business can currently accommodate these visitors and look for gaps that can be addressed. 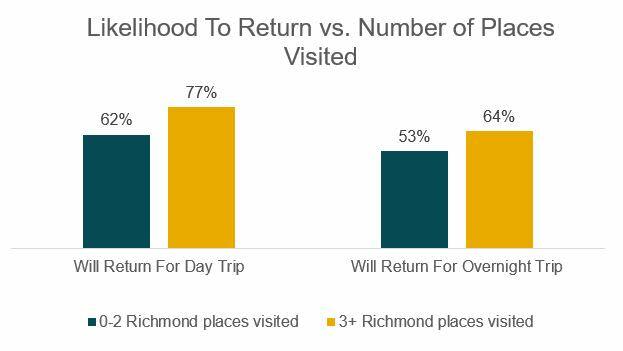 When visitors do more activities, and visit more places in Richmond, they are both more likely to recommend Richmond as a destination and more likely to return for overnight and day trips. For example, a visitor who visits Steveston and dines on Asian cuisine has views of Richmond comparable to those of top-tier Canadian travel destinations. 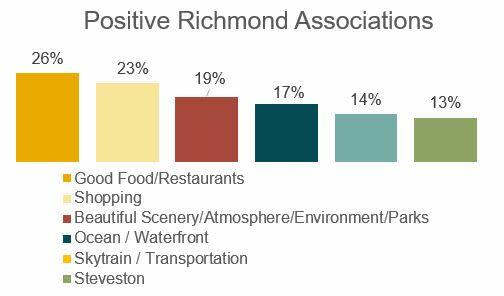 Thus, Tourism Richmond recommends that our stakeholders take a collaborative approach to attracting tourists where they cross-market with partners across industries and help support other tourism related businesses in order to keep visitors staying longer and doing more in Richmond, helping to increase repeat visitation which has already risen 6% since 2015. Tourism Richmond has a broad variety of materials and program in place to support our stakeholders including Co-Op funding to financially support 50% of marketing and experience development for out of town visitors, as well as materials at VisitRichmondBC.com/industry to help stakeholders provide better information to visitors about what there is to do in Richmond, and how to get there. There has been some great growth in our market and we’re excited to see continued success as our stakeholders work together so that we can all succeed together. There will be additional industry-specific presentations over the course of 2018 so stay tuned for future invites.